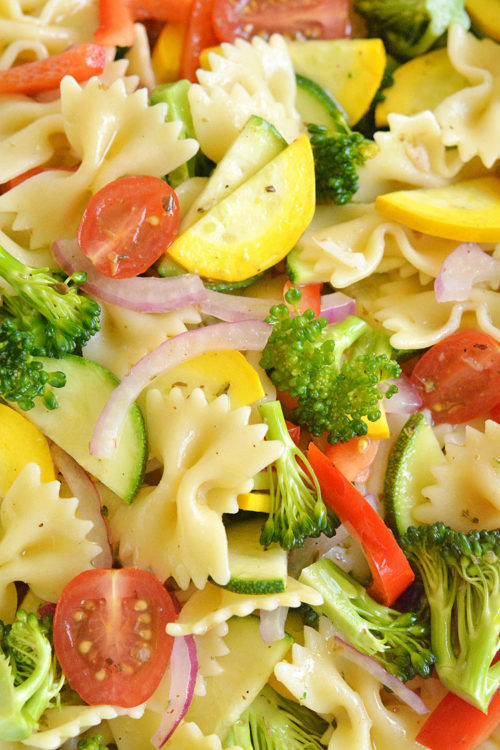 This garden vegetable pasta salad recipe is sooooooooo good! 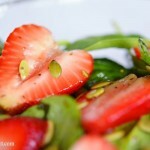 It uses all fresh, summer ingredients that combine to give it the most amazing flavour! It’s loaded with almost all the colours of the rainbow so you KNOW it’s healthy! And with a fresh citrus vinaigrette, it has just a subtle lemon tang to it. So good! And so healthy! We have had a really hot summer where we live. And now that I work from home, I realized that I barely leave the house. Yesterday we went for ice cream after dinner with the kids and I thought I was going to melt when we got into our black minivan. (Who on earth thought black was a good colour for a van!?) My poor 20 month old sat in his car seat saying “Hot! Hot!”. And then when we got up to the drive through window to pay, they didn’t have a container for the ice cream cones, so I had to balance three dripping ice cream cones in my hands. My husband tried to drive home as fast as he could, but my hands and jeans were covered in ice cream drips by the time we got there. Ah, the sweet memories of summer! Ha! It’s been roasting hot where we live the last few days with heat warnings and everything – Which for Canada, is saying a lot. The temperature with the humidity has been around 36C (97F) the last few days. Is that warm to you? Because I find it to be so hot and sticky that I’m just counting down the weeks until I can sleep with the blankets on top of me again. It may be hot out, but it’s getting to be one of my very favourite times of the year where all the vegetables are fresh and local and they have the most amazing flavours! 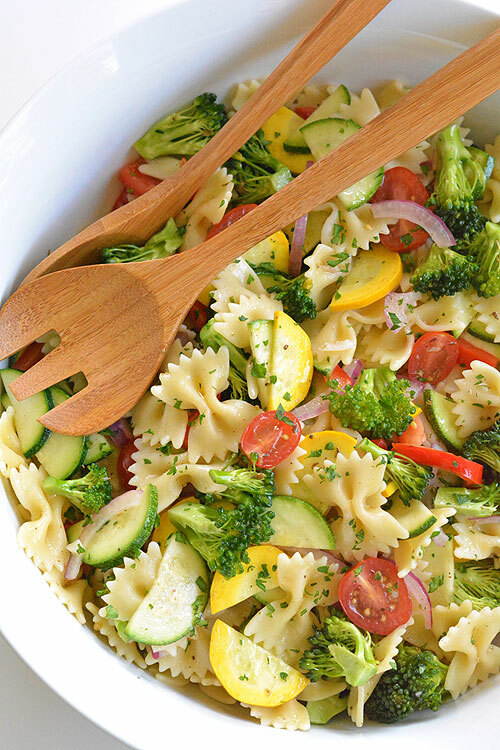 This garden vegetable pasta salad has all of the amazing vegetables that you can harvest from your own garden! That is, if you’re a better gardener than me. We grew cherry tomatoes this year, and that’s pretty much the extent of my gardening capabilities. But I’m loving the local produce at the grocery store! You can use your favourite noodle shape, but I LOVE the way the bow ties look! So pretty! I was inspired by the recipes over at Budget Bytes and Just a Taste. 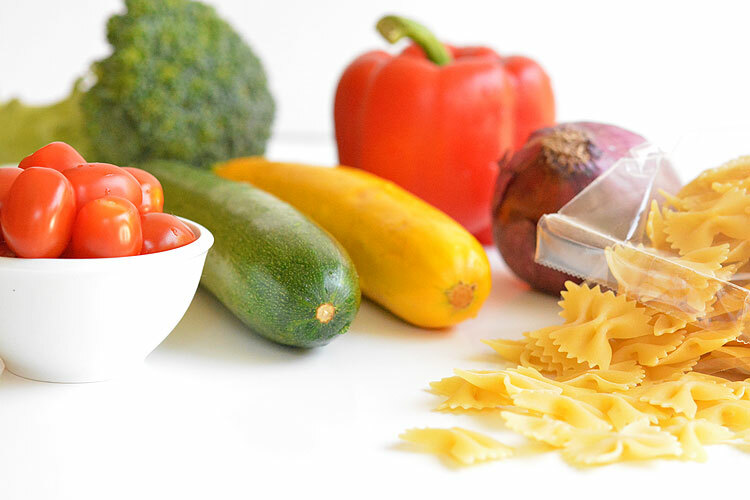 The more colourful your meals are (in terms of vegetables… not food colouring…) the healthier they are! And take a look at all of that fresh and colourful goodness! If you replace the red pepper with orange pepper it will be almost the whole rainbow! Down below, I’m going to give you the recipe for the citrus vinaigrette. But to be honest, it’s totally optional if you use it. If you’re in a hurry, feel free to save yourself the time and use store bought Italian salad dressing instead. It’s not quite as healthy as homemade dressing, but if you’re short on time, I get it. I’m a busy mom so I’m always up for a time saving tip! 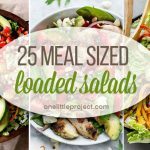 You can even make this salad a day ahead if you want to take it to a picnic or barbecue. In fact, when the flavours have a chance to marinate, it tastes even better! In case you’re wondering, all of the vegetables in the salad are uncooked. I’m not used to eating raw zucchini, but it was delicious! I just tried to chop the zucchini into thin slices and the broccoli into small pieces to keep the crunch manageable. But by the time everything was mixed and marinated, I could barely tell they were raw. Isn’t it the most beautiful salad ever? It’s just perfect for summer! It tasted sooooooooo good! All of the fresh vegetables combined into such a great flavour combination! And I love the citrus tang in the dressing! Yum! Meanwhile, chop the vegetables into salad sized pieces. 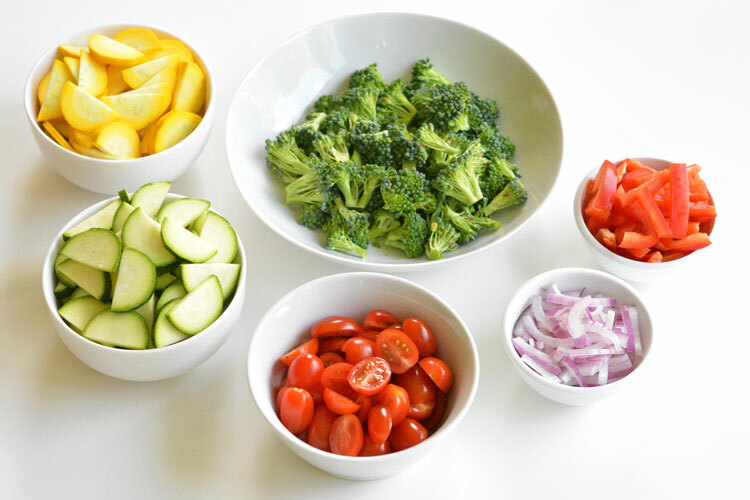 Combine all of the ingredients for the dressing in a small bowl and whisk until well combined. When the water comes to a boil, cook the pasta for 6 to 9 minutes until it's al dente. Drain the pasta. 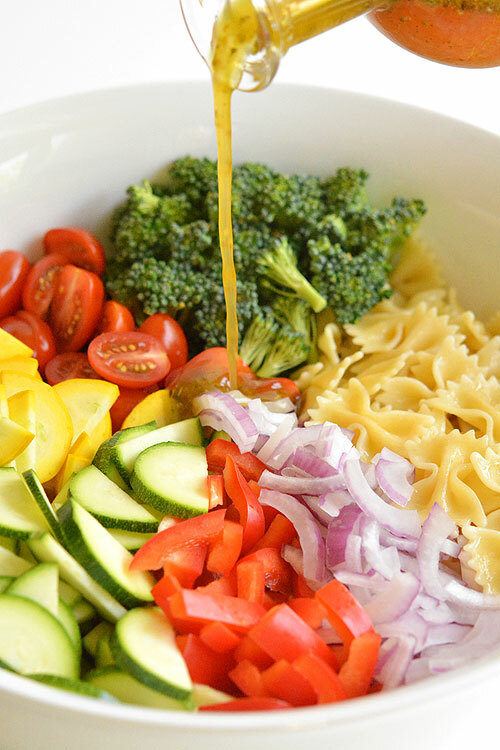 Stir about 1 Tablespoon of olive oil into the pasta to prevent it from sticking together and set aside the pot to cool, uncovered. Add the dressing and all of the vegetables to the pot. Toss to mix it all together and then transfer to a serving bowl. You can serve it immediately, but it tastes best if you let it marinate in the fridge overnight. Time Saving Tip: In a hurry? 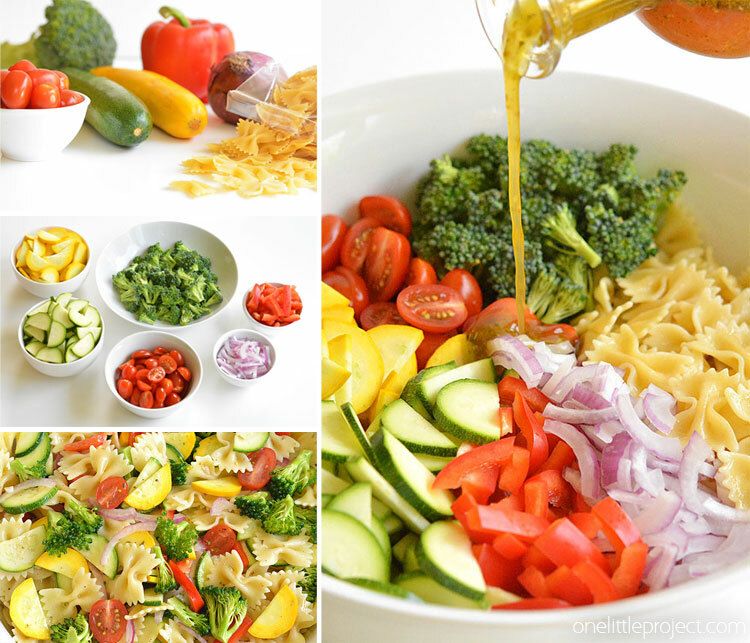 Use 1 cup of store bought Italian Salad Dressing instead of making the dressing yourself. 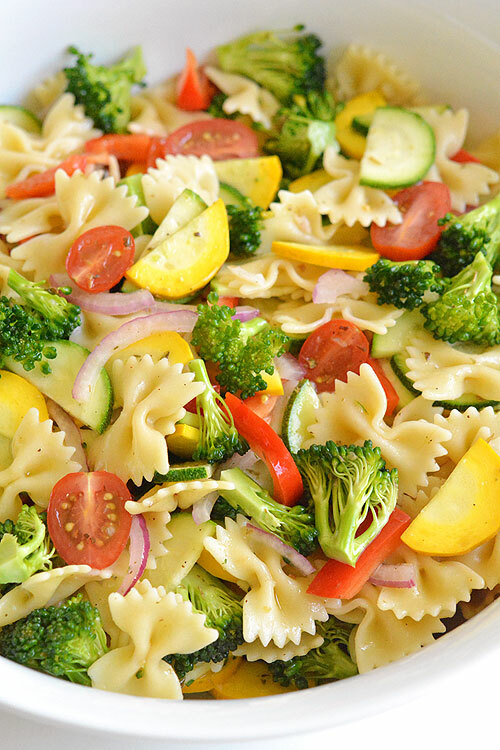 This garden vegetable pasta salad is such a delicious summer recipe! It can be made a day ahead so it’s perfect for a pot luck or barbecue. 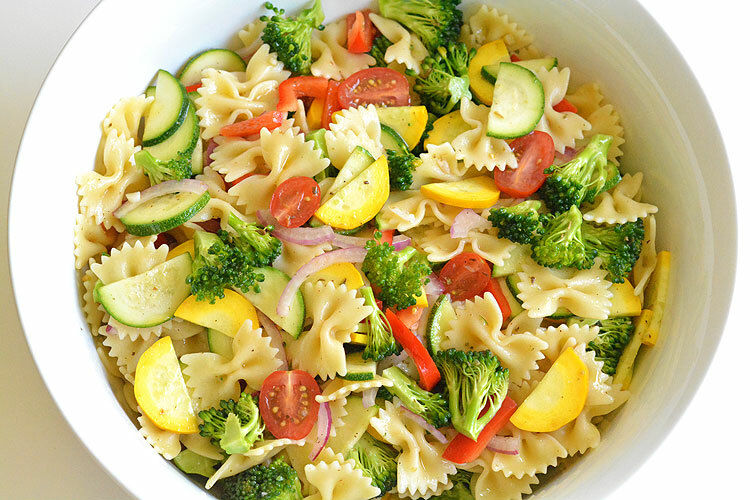 I personally LOVE having a big bowl of pasta salad sitting in the refrigerator all week. 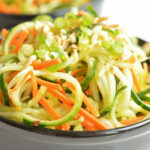 It makes such a healthy and EASY side dish to throw on our dinner plates. And in this hot, hot weather, a nice cool pasta salad dish is the perfect addition to almost any summer dinner! 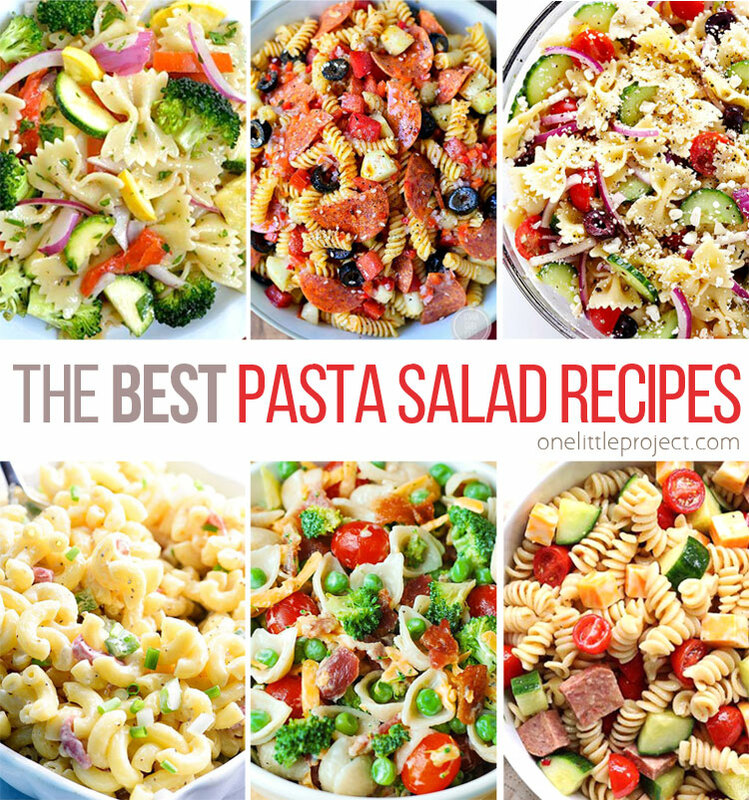 Want to see even more pasta salad recipes? 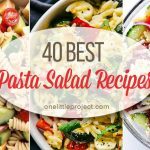 Check out our awesome roundup of the 40 Best Pasta Salad Recipes! This was very pretty, very tasty and very easy to make. Thank you for posting this. I’m not a big fan of pasta salad with mayonnaise, so this was perfect.